I know the holiday season is still a few days away, but I’ve already started preparing my list. What about you? From lining up outside the retailers for those awesome Black Friday deals to scrolling through Amazon, Best Buy etc. all day on the Cyber Monday sale day, you cannot afford to miss all the amazing holiday season deals. They do make holiday shopping easier on the wallet. But no matter whom the gifts are for, it’s the children in the house who will be the most excited about them every single time! So keeping this in mind, I have prepared a list of electronic devices which children love, and also help them to be healthy and active! Do help the parenting community by adding cool new items/apps to the list by that you’ve discovered with your kids in the comments section below. With the new iPhone X, facial recognition feature is what the world has been excited about, but at our home, the entire family is all charged up for the launch of all kinds of awesome AR apps! What excites me about the AR apps is that they make you get up from your seat, get on your feet and move around! Kaju might make an appearance in a brand new AR app as well? Let’s just say he’s looking forward to spreading some Christmas cheer this year! So getting a new iPhone would be a wonderful gift for the entire family this holiday season! Did you know that the AR apps are compatible with iPhone versions 6S plus and above! So, in case, you have a compatible device, do try out all the different AR apps and let me know your favourite app in the comments section below. The iPad is no longer just an engaging toy for your child, which is small enough to fit in your bag, and can be taken anywhere on the go. But, now studies have indicated that iPad can have real educational benefits for children! This app is already making learning numbers as fun and easy as playing for thousands of kids all over the world! And, just like the iPhone, children can engage with all the AR apps on their iPads too! But for that you will need an iPad pro or a 2017 edition iPad! Not an iOS fan? No worry, Android is not far behind! With many awesome launches this year like the Google pixel 2, Samsun Galaxy etc., One plus 5, Nokia etc. you have way too many options for you to choose from. Check out my recent post Top 4 kids friendly Smartphone and Tablets. Also, all your Kaju apps are also available on the Android’s Play Store. Have an LED/LCD TV in your house, you should definitely get an Chromecast device to connect to your device! What is a Chromecast Device? Chromecast is a device that you plug into your TV’s HDMI port, powered by a USB cable. Using your smartphone or computer as a remote control, you can use Chromecast to access video content from Netflix, YouTube, Hulu, the Google Play Store and other services. Apart from this, you can also play your Kaju games on your TV by casting it on your TV with the help of a chromecast! 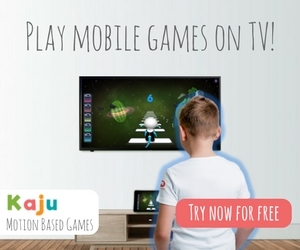 Visit Kajuafterschool.com for awesome games you can play on your TV through Chromecast! Android TV is designed to bring the sorts of things you enjoy on your phone to your TV! So all your apps, like Netflix, Youtube, etc. will be available on the Android TV as well and also all you will be able to cast your Kaju apps on your TV with the in app casting feature! This is a fun dance game app designed to get kids on their feet while they listen to their favourite kids songs and nursery rhymes! ‘Learn Numbers with Kaju’ is not just a fun kids maths game that teaches them counting, addition, multiplication etc., but it teaches them in a way children like to learn i.e. Play and Learn! To play this learning games children have to jump and hop, which is detected by various sensors on your phone. Things that fly is a fun game for kids which helps them learn about different birds that can fly! The motion tracking technology in the app helps us track your child’s movements. With this tracking we make learning about birds and animals a fun experience for children by asking them to flap their hands like a bird’s wing when they see a bird in the game!